Monthie Mechanical Inc is proud to serve the Richmond community! 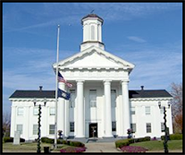 Richmond, Kentucky is located in Madison County, approximately twenty-five miles south of the city of Lexington. Richmond was founded in 1798 by Revolutionary War soldier Colonel John Miller and named in honor of his hometown, Richmond, Virginia. Today, Richmond serves as the county seat of Madison County and is home to a growing population of more than 30,000 residents who enjoy the area’s seasonal weather that brings long, hot summers and mild, cool winters. History lovers will want to visit Fort Boonesborough, a state park located on the banks of the Kentucky River that features camping, hiking, boating, a junior Olympic-size swimming pool and more, as well as a replica of Fort Boonesborough and the Kentucky River Museum. The White Hall State Historic Site features an historic Georgian style brick home built by General Green Clay in 1798. General Clay’s son, Kentucky state legislator Cassius Marcellus Clay, added on to the home in the 1860s, transforming it into an Italianate style mansion and renamed it White Hall. The site features a stone kitchen and loom house built during the 1700s, as well as artifacts that include household furnishings and the memoirs of Cassius M. Clay. Lake Reba, the city’s 600-acre park complex, is a great place to spend an afternoon or a day. With amenities that include baseball and soccer fields, a horseshoe complex, walking trails and a 75-acre fishing lake, the park offers fun and entertainment for the entire family. The park also features Gibson Bay, an 18-hole championship golf course, and Adventure Falls, a miniature golf and batting cage complex located right around the corner. The Richmond Area Arts Council is just one of the city’s many valuable service organizations. The council is housed in the old Episcopal Church building, circa 1887, and sponsors concerts, art exhibits, after school & summer programs for children, and more! The city’s rich history, friendly faces, outstanding entertainment opportunities, and community spirit all serve to make Richmond the “City that Works” for everyone!